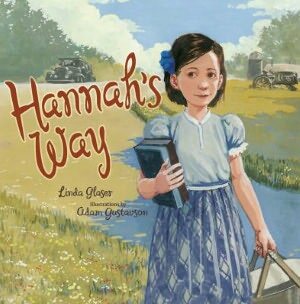 In this special post, The Whole Megillah speaks with author Linda Glaser, publisher Joni Sussman and illustrator Adam Gustavson about Hannah’s Way, published recently by Kar-Ben. The Whole Megillah (TWM): In your author’s note, you state a 1996 exhibit at the Minnesota History Center inspired you to write this story. Please tell us more. Linda Glaser (LG): The exhibit, “Unpacking on the Prairie, Jewish Women in the Upper Midwest,” covered the time period of 1880s and beyond. A small section of the exhibit included people’s memories told in their own words. One story particularly caught my attention. The girl in the account wanted to go to a school picnic that was scheduled for Saturday but riding on the Sabbath wasn’t allowed in her Orthodox Jewish family. Her classmates, when posed with the problem, chose to walk to the picnic so that she could be part of it. I was so touched by this display of empathy and inclusiveness that I wanted to transform it into a children’s book. Over the years, I tried many versions. As Hannah’s Way evolved, I kept the essence of the actual story but fictionalized many of the details. I added the theme of “being the new kid in school” and wanting to make friends. I also included the strong emotional thread of feeling different. My goal was to make the story accessible to elementary age children of all backgrounds. TWM: Please describe your work with genealogist Joanne Sher to ensure your manuscript’s historical accuracy? LG: Joanne Sher is an extraordinary genealogist and an expert on Jewish history in the Midwest. I posed my problem to her—that I wanted my main character to have moved up from Minneapolis and to be the new girl in school. Joanne helped me find a time period when that would have occurred. She also helped me work out a scenario for the father. We decided that he had lost his job in Minneapolis during the Depression and was forced to move his family to a small town in northern Minnesota where he could find work with one of his relatives who was a merchant. Joanne assured me that this was accurate for those times and also that it would not have been unusual for Hannah to be the only Jew in her school. TWM: What other research did you do to support your manuscript? LG: Since picture books have so few words, it’s especially important that every word and concept be accurate. So, when I write, I continually check details for accuracy and then double and triple check my findings. It is part of the process of writing. I also have a wonderful writing group that, among other things, points out any possible inaccuracies. Obviously, it’s essential that the illustrations be correct as well. So I’m most grateful to Adam Gustavson for devoting so much care and attention to historically accuracy. TWM: What challenges did you face in developing Hannah’s story? LG: One challenge was to figure out how to incorporate Hannah’s family background and her problem into the story without being wordy or heavy-handed. The information needed to be there so that readers would easily understand and empathize with her dilemma. Yet it was equally important that the information not stand out as “telling.” It took some time to develop the story well enough that I could then cut out all the extra and only leave what was truly necessary. TWM: What was your greatest satisfaction in developing the story? LG: I feel very good about the fact that I developed a story that works for children of different backgrounds. Recently, I presented Hannah’s Way to an inner city school. Although none of the students was Jewish, I was heartened to see how strongly they related to Hannah and her predicament. In fact, some were on the edge of their seats rooting for her! Clearly, the themes of wanting to be included and feeling “different” are compelling and universal ones. In fact, the principal of the school plans to include Hannah’s Way as one of her “books of the year” to help promote caring and sensitivity to others. I find it most satisfying that this story speaks to a wide variety of children. I hope Hannah’s Way will plant seeds of empathy and inclusiveness among many of its readers. TWM: Now, let’s turn to Joni Sussman. What attracted you to this manuscript? Joni Sussman (JS): First, I’m a Minnesota girl born and raised— my parents are Holocaust survivors who immigrated to Minnesota after the war, a fascinating story in its own right—and Kar-Ben receives few Jewish stories that take place in this part of the country. Also, I saw the exhibit at the Minnesota Historical Society on which the story is based; the history of the Jewish community of Minnesota is an interesting one. Just as we strive to portray all kinds of Jews in our stories, from traditional to liberal, we also like to portray Jews living in different parts of the country, for example, our new book Lights Out Shabbat takes place in Georgia. In addition, as few of your readers are likely to know, from the 1930s through the 1950s Minnesota was a hotbed of anti-Semitism; a 1946 newspaper story described Minneapolis as the most anti-Semitic city in the country. Then-Mayor Hubert H. Humphrey reacted to the article, appointing a special commission to investigate. Some say Humphrey’s confrontation with this particular instance of home-grown bigotry may have triggered his commitment to civil rights and human rights, which was the foundation of his political career. So when I read Hannah’s Way, which depicted a story with the opposite premise—a group of non-Jewish schoolchildren in rural Minnesota in the 1930s rise to the occasion and make a real effort to make a Jewish student feel welcome in their community—I loved it. This theme also has universal appeal beyond the Jewish community. It’s received excellent reviews and has been purchased by many public schools and libraries in addition to Jewish ones. TWM: What criteria did you use to identify Adam as the appropriate illustrator? JS: Adam Gustavson is a terrific illustrator. This is the first book he’s illustrated for Kar-Ben. When selecting an illustrator for a particular story I always create an “art profile” which details what I consider to be important aspects of the illustrations. For example, this story involves both adult and child characters—can this artist draw both well? This story has a historical setting so does this artist do a good job when illustrating period settings? Does this artist have the suitably serious representational yet kid-friendly illustration style we want for this book? Adam seemed the perfect fit. I especially loved his attention to detail, and the examples in his portfolio showed me that he was fully capable of doing a beautiful job with a story in a historical setting. What was unusual in working with him was that he took it upon himself to do the historic research. More typically an illustrator will ask us to do the research and send examples of the styles of clothing, backgrounds, etc. we’d like to see, which we are happy to provide. But Adam did the research himself, going so far as to determine whether schoolchildren raised their hands in the classroom or stood up when the teacher entered the room back in those days, details that a reader might easily not notice but that Adam (and we) felt were important to the integrity of the story. TWM: At what point in the process do you identify the illustrator? JS: We begin our illustrator selection process quite early in the game. Once we determine the publication date of the book, we determine the art schedule and then begin the search for the perfect illustrator. Potential artist availability, schedule, budget and other factors weigh into the process. We have many resources from which can select a potential illustrator, from artist agent inquiries to direct artist inquiries, as well as approaching illustrators with whom we’ve previously worked and/or those who have illustrated other books we’ve liked. We always have a “vision” for what we want the book to look like—how many pages it will be, what size it will be, etc., which depends on age and interest level of the story. We then provide art direction to the illustrator—not just which words go on which page or what art should go on each page but also, for example, whether the scene should be treated as an individual page or a two-page spread and whether the art for a particular page should be made up of vignettes or a full page scene. This art direction isn’t carved in stone, however, so if an illustrator has ideas of his/her own they’re often able to incorporate. Adam had lots of his own suggestions and ideas and we were happy to work them in. He also gave us excellent detailed sketches, which not all illustrators do, so we knew exactly what to expect from the finished art, which we greatly appreciated. TWM: Adam, how did you conduct your research to illustrate Hannah¹s Way? Adam Gustavson (AG): I had a few different routes, depending on which aspect I was researching, though the majority of the research was done online (Minnesota is a long drive from New Jersey, or I would have been happy to trek out). One of the first things I dug into was costume reference. I have a few items I’ve purchased over the years off of Ebay for various illustration projects, and I also went through quite a few old family photos to get my bearings. I’ve gotten pretty good at very specific Google and stock photo searches these past few years; I now have a virtual library on my hard drive of grade school class photos from rural Minnesota. My family isn’t Jewish, so I also read a number of scholarly essays and did some very specific online family photo searches, just to avoid any embarrassing gaffes on my part. The socioeconomics of the characters also become a consideration. When researching things like furniture or fashion, it’s important to remember that rural folks didn’t exactly buy what was in the catalog that month. Dressing characters in hand-me-downs ‹ or furnishing their homes in things they bought before the Depression ‹ really involves getting into the heads of these characters. How proud or pragmatic do I think they are, based on clues left in Linda’s manuscript? I’ve been known to decide in my own private narrative when it was characters immigrated, and what they brought with them, as opposed to things they accumulated new. I based Hannah’s school on the architecture and layout of several boxy schoolhouses that would have seen use during the story’s timeframe; I had to assign her grade a classroom, and then remember what side the windows were on (as well as what time of day it was) for each vantage point I chose in the interior. I found examples of desks and the like (again, remembering that this district didn’t buy new furniture often) for sale on online auction sites. By the time I actually started drawing, I had a one inch binder full of print outs. TWM: What medium did you use and why? AG: The paintings were executed in gouache on paper. I hop between gouache (an opaque watercolor) and oil in my work, often depending on the feel of the story. Oil paintings can carry with them a sort of gravitas, due to the richness of color and the complexity of the paint surface, and I didn’t feel like that was a good fit for Hannah’s emotional state throughout the story. Linda’s manuscript had a delicacy to it that I really wanted the art to dovetail into, and Joni was trusting enough to give me the flexibility to make that decision. TWM: How did you decide what exactly to illustrate? AG: There’s a tricky balance to strike between what would make a good picture and what will help with the story. One of the first things I do is to really consider the blocks of text that the story has been broken into; I place them in a layout and determine (in this case, along with Joni’s thoughtful page break suggestions) on a fairly visceral level where text blocks should go. Does the narrative happen after the reader has encountered the art, or before we drift into the image? Once I’ve figured that out, I also look for excuses to fit the text into the art as seamlessly as possible: walls, skies, floors, or just the white of the paper around an oddball vignetted edge. Vantage points—the eye level with which we enter the image—have a lot to do with the psychology of a given point in the story as well as the overall flow of the book. There are places where Hannah’s predicament is out of her control, and the vantage point needs to communicate that (sometimes an aerial view is just what’s needed to remove a character’s sense of control; other times worm’s eye view can lend us a scene’s tension). A day time illustration gives the option of angular light and shadows for dynamics, which won’t be there if we’re indoors around evening time. So I look for all of these excuses to keep things moving and interesting, and obsess about where they’ll be most appropriate. As much as we’ll need to see Hannah’s joyous or crestfallen expression, it’s important to me that that isn’t all we’re riding on. TWM: How did you decide on the size of the illustration for each spread? One of the nice things about a book is the spine. It can be a challenge to work around, but it lends a left-versus-right dynamic, or a punctuation mark to the pacing of the story. Like hitting return, using a comma, or ending with a period, it lends another small pause. It can also (as in the case of Hannah asking her parent’s permission to ride in a car) put a very literal chasm between characters. I try to think about whether a scene wants that, as in Hannah’s repeated attempts to get permission, or whether everyone is better grouped in a foreground/background situation, as occurs during her brainstorm toward the end. Extra items, either spot illustrations or an object breaking the border, can serve to lead us in or out of the image. It’s not always that cerebral; some scenes just need to go from left to right to help the story along. Another size consideration is the scale of the final paintings. I’ve been known to work anywhere from 100% of scale to a full 200% when painting images. I make that decision based on what’s easiest; if a facial expression is important, there’s an optimal size for me when it comes to moving a brush around on someone’s face, so I enlarge the entire piece to fit. Working in gouache, as in Hannah’s Way, makes some things easier than others, so it all comes down to what’s in the image and what size brush stroke would be appropriate. This entry was posted in Three-in-One and tagged Adam Gustavson, Hannah's Way, Jewish children's picture books, Joni Sussman, Kar-Ben, Linda Glaser, Minnesota Jewish history. Bookmark the permalink. Excellent, Barbara! So wonderfully thorough! Thank you!! Oh, my. This is probably the best overview of a book and the publishing process I’ve ever seen. Thanks, Barbara, for putting this together. I loved every word and ordered the book right up. I can’t wait to see it. Of course, I’m a Minnesota girl myself, so this really strikes a chord. Thanks, Rosi. It’s a wonderful book and I know as a history writer yourself, you’ll really enjoy it. that Adam Gustavson will be the one to illustrate it! Finally had a chance to read your blog. Enjoyed it! This was great to read. I love to keep up on new Jewish picture books. I love the theme of this one and love how you keep us informed. Thanks, Barbara. I wish this book much success. Pingback: Needle in the Bookstacks » The Carnival strikes again! Just read this and got here because of the Sydney Taylor Award win for this book! This is a fascinating and thorough interview. I will share the link with others, thanks, Barbara.